Make a French tradition your own this year and try the delicious “galette des rois” an almond cream filled pastry. 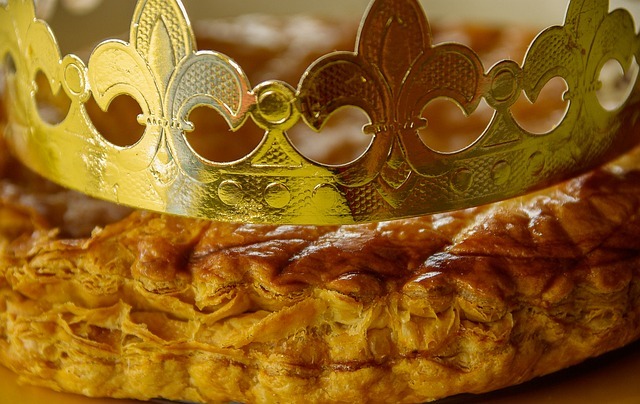 Every year, all over France, families share the galette des rois (King’s Cake) on January 6th to celebrate the Epiphany: the day of the visit of the Magi (three Wise Men) to the infant Jesus. While this tradition sounds religious, it has been adopted by French families of all religions – as if we needed one more excuse to gather after Christmas! Note that the known “King Cake” from Louisiana is very different from the French galette. The traditional French cake, is a children’s favorite because it hides a secret gem: “La Fève.” La fève is a small china token that can take many shapes. Hidden by the baker in the cake, this little charm is a treasure to children all over France. The process of eating the cake is a whole ceremonial: while the parents cut the galette, kids hide under the table and shout out the names of family members to distribute each slice of the warm tasty pastry. Parents claim this prevents children from cheating and picking the slice with the so-wanted-fève for themselves but it’s actually a way for parents to give the figurine to one of the children. Everybody gets to savor the galette together and whoever gets the fève becomes the king or queen for the day. Plus the lucky winner gets to wear a shiny gold paper crown and pick a partner queen or king. The tradition is that if an adult finds the fève he or she must buy a new galette for the next galette party. Yes, as every “boulangerie-pâtisserie” (bakery) in France will sell various sizes of galettes des rois during the whole month of January, starting from immediately after Christmas, you are most likely to celebrate the Epiphany more than once! In Provence the ‘galette’ takes the form of a ring of brioche with candied fruits on it. Fèves are usually collected and can be quite beautiful. Julia, TripUSAFrance’s tour guide, being born on January 11th has had as a birthday cake every single year the well-known galette des rois. It was such a disappointment year after year because there was no surprise on which cake she would get… she knew that the galette was waiting in the kitchen topped with candles every-single-time. After moving to America, Julia never received another galette for a birthday. She now realizes how lucky she was to be able to taste the delicious pastry every January and misses very much the delicious almond cake. If like Julia you miss the galette or simply want to try it out, it can be found in the DC area at Paul (many locations), Patisserie Poupon in Georgetown or Je Ne Sais Quoi in DuPont circle. Thank you for all the great recommandations! I tried it last night and it is truly delicious! I hope one day I’ll get to have a galette in France.